Do Infants Have a Growth Spurt at Four Weeks Old? During the first year of life, your infant is likely to triple his birth weight and grow at least 8 inches in height. However, most of this growth will not happen in a slow, steady pattern; most babies experience growth spurts during which they grow a lot in a short amount of time. Although every baby is different, there are certain ages at which most babies seem to experience growth spurts. One of these common growth spurts occurs around 4 weeks. The 4-week growth spurt is not the first growth spurt that most babies experience. 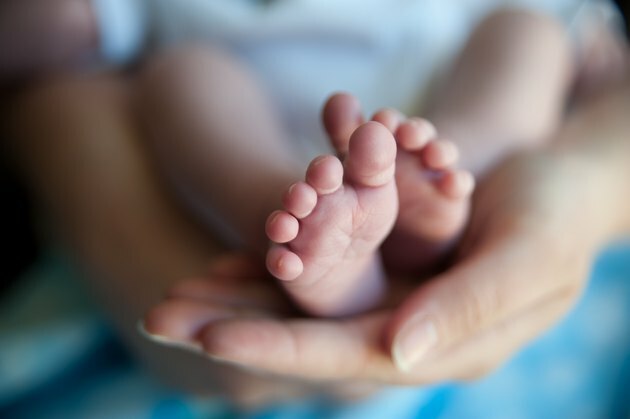 According to lactation consultant Kelly Bonyata, most babies have had several growth spurts by the time they are 4 weeks old, including one at 7 to 10 days and one at 2 to 3 weeks old. However, the 4-week growth spurt can be especially difficult for first-time parents because it often occurs after your baby seems to be settling into more of a schedule than she had during the first few days. Although she isn't sleeping all night yet, she may be eating slightly less often than she was in the early days, so it can surprise you when she suddenly wants to eat all the time during the growth spurt. During the 4-week growth spurt, your baby will probably want to eat much more frequently. He may also sleep much more frequently and for longer stretches. When he is awake, he might be fussier than usual and be difficult to console. You might also be able to observe the cause of all these symptoms: according to a study by Michelle Lampl of Emory University, your baby could gain as much as 3 ounces in 24 hours. Your breast-fed baby might seem fussier during a growth spurt, but that doesn't mean that she's hungry and needs you to supplement breast milk with formula. Your breast milk functions on the principle of supply and demand, so as your baby wants to nurse more often, your body will produce more milk to meet her demand. If you feed her on demand during the growth spurt, then your body will produce more milk to meet her greater need for food. Your increasing milk supply might make you more hungry and thirsty, so eat enough to meet your own needs as well. If your baby continues to be extremely fussy after a few days or a week, or if she begins to lose weight, talk to a board-certified lactation consultant about your concerns. Formula-fed infants need to eat on demand just like breast-fed infants do, especially during the newborn stage. During the 4-week growth spurt, your infant will probably want to eat more frequently than usual. With a formula-fed infant, it is important that you distinguish between hunger cries and other types of fussing, because unlike with a breast-fed baby, it is possible to overfeed with formula. If your baby is hungry, he will exhibit other indications of hunger besides just fussiness, such as moving his head from side to side, opening his mouth, rooting and puckering his lips. During the growth spurt, pay close attention to your baby's hunger cues, and don't delay feedings based on the clock.